AUD 20,250 Excl. Duties / Taxes. This Asscher diamond is 1.8 carat in weight, and comes with Excellent polish and Very Good symmetry, as verified from an independent gemological laboratory. The diamond is graded E in colour, and has a clarity grade of VS1. The diamond's GIA grading report number is 1297098045, which will detail further its specifications and measurements, and will also come with the purchase of the stone. AUD 6,271 Excl. Duties / Taxes. This Asscher diamond is 1 carat in weight, and comes with Very Good polish and Excellent symmetry, as verified from an independent gemological laboratory. The diamond is graded E in colour, and has a clarity grade of VS2. The diamond's GIA grading report number is 2146665544, which will detail further its specifications and measurements, and will also come with the purchase of the stone. AUD 20,910 Excl. Duties / Taxes. This Asscher diamond is 2.05 carat in weight, and comes with Excellent polish and Very Good symmetry, as verified from an independent gemological laboratory. The diamond is graded E in colour, and has a clarity grade of SI1. The diamond's GIA grading report number is 1149799920, which will detail further its specifications and measurements, and will also come with the purchase of the stone. This Asscher diamond is 1.21 carat in weight, and comes with Excellent polish and Excellent symmetry, as verified from an independent gemological laboratory. 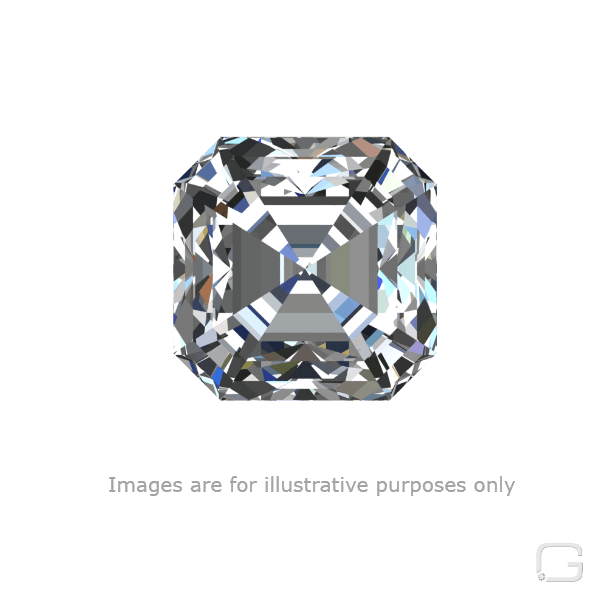 The diamond is graded E in colour, and has a clarity grade of VVS2. The diamond's GIA grading report number is 5181673775, which will detail further its specifications and measurements, and will also come with the purchase of the stone. AUD 21,341 Excl. Duties / Taxes. This Asscher diamond is 2.01 carat in weight, and comes with Very Good polish and Very Good symmetry, as verified from an independent gemological laboratory. The diamond is graded E in colour, and has a clarity grade of SI1. The diamond's GIA grading report number is 16784174, which will detail further its specifications and measurements, and will also come with the purchase of the stone. This Asscher diamond is 0.85 carat in weight, and comes with Excellent polish and Very Good symmetry, as verified from an independent gemological laboratory. The diamond is graded E in colour, and has a clarity grade of VS2. The diamond's GIA grading report number is 2175543911, which will detail further its specifications and measurements, and will also come with the purchase of the stone. AUD 6,543 Excl. Duties / Taxes. This Asscher diamond is 1.01 carat in weight, and comes with Excellent polish and Very Good symmetry, as verified from an independent gemological laboratory. The diamond is graded E in colour, and has a clarity grade of VS2. The diamond's GIA grading report number is 2204365529, which will detail further its specifications and measurements, and will also come with the purchase of the stone. AUD 7,096 Excl. Duties / Taxes. This Asscher diamond is 1.01 carat in weight, and comes with Excellent polish and Very Good symmetry, as verified from an independent gemological laboratory. The diamond is graded E in colour, and has a clarity grade of VVS2. The diamond's GIA grading report number is 1265238954, which will detail further its specifications and measurements, and will also come with the purchase of the stone. AUD 31,033 Excl. Duties / Taxes. This Asscher diamond is 2.01 carat in weight, and comes with Very Good polish and Very Good symmetry, as verified from an independent gemological laboratory. The diamond is graded E in colour, and has a clarity grade of VS1. The diamond's GIA grading report number is 16804667, which will detail further its specifications and measurements, and will also come with the purchase of the stone. AUD 13,662 Excl. Duties / Taxes. This Asscher diamond is 1.78 carat in weight, and comes with Very Good polish and Excellent symmetry, as verified from an independent gemological laboratory. The diamond is graded E in colour, and has a clarity grade of SI1. The diamond's GIA grading report number is 2175737077, which will detail further its specifications and measurements, and will also come with the purchase of the stone. AUD 32,519 Excl. Duties / Taxes. This Asscher diamond is 2.52 carat in weight, and comes with Excellent polish and Excellent symmetry, as verified from an independent gemological laboratory. The diamond is graded E in colour, and has a clarity grade of VS2. The diamond's GIA grading report number is 2181298846, which will detail further its specifications and measurements, and will also come with the purchase of the stone. AUD 20,602 Excl. Duties / Taxes. This Asscher diamond is 1.75 carat in weight, and comes with Excellent polish and Very Good symmetry, as verified from an independent gemological laboratory. The diamond is graded E in colour, and has a clarity grade of VVS2. The diamond's GIA grading report number is 2185685708, which will detail further its specifications and measurements, and will also come with the purchase of the stone.